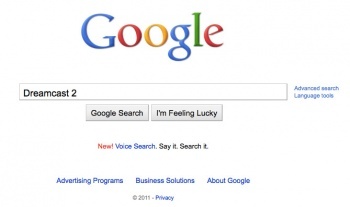 A new job listing posted by the ubiquitous search engine firm reveals Google's plot to break into the gaming industry. A virtual "help wanted" ad appeared on Google's site this morning, seeking a "Product Manager" for the the firm's previously non-existent games wing. We are looking for a strategic, technical and game-loving Product Manager to drive Google's gaming strategy. You will design strategies for game distribution and discovery, player identity, game mechanics, and more. In addition to designing a great user experience and building out key partnerships, you will be significantly influencing Google's social platform as you work directly with a critical set of early adopters, game developers. Interesting and impactful decisions involving social gaming, privacy, virality, business, and technical APIs await you and the strong, passionate team of gamers you will work with. This being a job listing, it doesn't exactly connect the relevant dots on what Google's plan might be, but Engadget seems convinced the company is eyeing the world of social gaming first and foremost. "Obviously, with just a job posting to work with, details are scant, but we can tell you that the gaming platform will boast some social features -- an area where the Goog has struggled mightily," the site states, before speculating on how the firm might leverage its existing properties (the Android OS and Chrome browser in particular) toward the establishment of a gaming empire. If I can play Devil's Advocate for a moment however, I'd like to posit the idea that this "Games At Google" initiative will go off in a wholly unforeseen direction. If nothing else, Google is a company of creative, brilliant minds, and when they set their sights on a market segment they usually create a huge name for themselves almost immediately. Now, how could a company with vast resources and an army of clever tech folk immediately impress large swaths of the games buying public, immediately earning both immense profits and increasingly valuable positive public opinion? Exactly. Google is joining forces with Sega to launch the Dreamcast 2*.